Over the last 25 years, the web has evolved from a platform consisting primarily of human content consumers to a blended model of humans and machines. With the explosion of data on the web, it is clear that machines are needed to assist in the consumption and organization of the massive amounts of data and content that’s created on the Internet every day. In 2014, studies reported that non-human visits account for 56% of all website traffic. So how does this affect how we create digital content?. 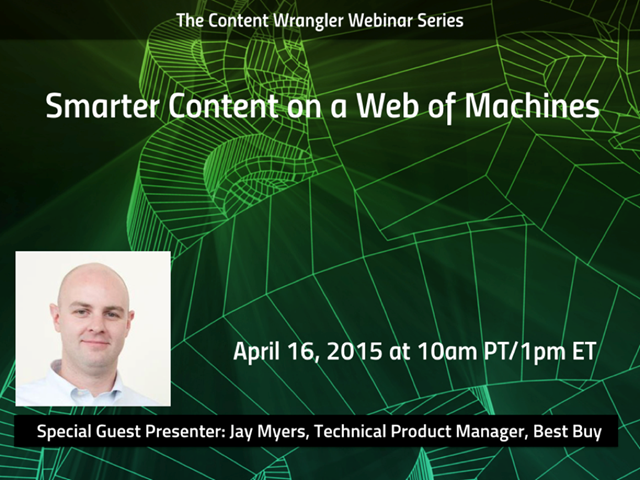 Join Scott Abel, The Content Wrangler, for this free one hour webinar with Jay Myers, Technical Product Manager at Best Buy, as Jay examines the origins and rationale behind publishing smart content, explores simple techniques we can use to make content better for both humans and machines, and provides examples of where smart content is used to provide more engaging user experiences.